The Notts Free Space is now open to the public. 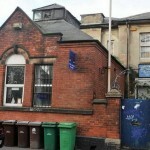 We are occupying the former Conservative Social Club on Church Street in Lenton. Please come and support us tonight and tomorrow whilst we get off the ground. A programme of events will be taking place throughout the week. The spirit of occupation is spreading throughout Cardiff as it was announced today that a group calling themselves The Great Tax Invasion have ‘occupied’ the old Inland Revenue Offices on Westgate Street, in the city centre. 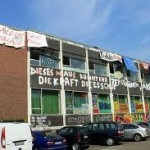 Activists started squatting in the building earlier this week saying their aim is to raise awareness of the amount of empty buildings which they feel should be made available to the benefit of the community. 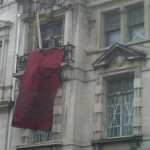 The occupation was announced with a banner drop while Food Not Bombs South Wales provided vegan soup to people outside the building. It’s new! It’s free! It’s in Cardiff! 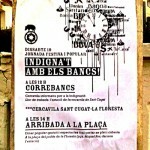 Now there are 3 ex banks OCCUPIED around Barcelona. 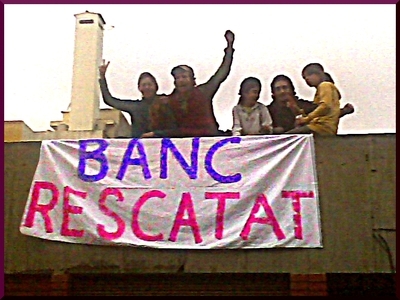 And on Friday a big crowd played cat and mouse with the baffled police, before successfully occupying another huge building as a ‘home for evicted mortgage defaulters’. The latest Bank was taken in the La Floresta suburb. After a leafleting and graffiti march around local banks the local ‘Indignats’ cooked an enormous veggie Paella for up to 200 people. 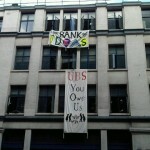 Finally they enacted a drama in the street which ended..SURPRISE in the occupation of an adjoining abandoned bank. (Still going strong). La Floresta is close to the new Occupied Castle Social Center (see post), begun just last week, so there’s plenty of local action, including a small consumers CoOp, an occupied community garden.. and more stuff. 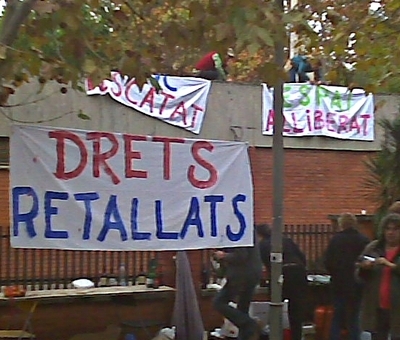 On July 5th 2011, Labège PJJ (Legal Protection of Youth) offices were visited, turned upside down and tagged as a protest against its participation in jailing young people. While the PJJ cried over its work conditions, at the Lavaur EPM (Youth Jail), which is coordinated by the PJJ and the prison administration, kids considered as lost were smashed up by the infamous ERIS unit (Regional Team of Intervention and Safety). First building for the economic justice campaigners as they occupy third space in borough of Hackney, alongside existing spaces in the City of London and borough of Islington. The new ‘Bank of Ideas’ will open to public this Saturday. Offices and meeting rooms will be available for those that have lost their nurseries, community centres and youth clubs due to savage Government spending cuts. Just a quick update and some thoughts from a friend of the Factory. I managed to take a bit of time away from working and went down to see what was happening at The Factory. Cops and robbers were standing around “protecting” the building and photographing the public. It has been completely evicted as far as I can tell. Chatted to a few folk who were about so this is a mainly a second hand account. I suspect that the occupiers will comment later after they have got some rest. In his usual dim-witted way, ‘Mad Mike’ Weatherley has been making fatuous comments regarding (unnamed) homelessness charities endorsing his campaign to criminalise squatters, all squatters being lifestylists or how Brighton police have never convicted squatters in eighteen years. All these remarks are ill-informed, for example the last – there haven’t been any convictions because it’s not a criminal offence (although the police do often make sure to frame squatters for other alleged crimes). 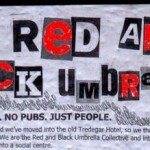 For the last week Cardiff has seen a new squatted social centre, an old derelict pub turned into life and happiness with numerous people and projects setting up. The old abandoned building has been empty for years in a run-down neglected area of Cardiff. 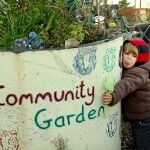 The residents intend to open it up for use by all radicals and locals. The support has already been great and the first fund raising gig was held on Sunday. Yesterday we made a little action in Prague to support the struggle against the criminalisation of squatting in UK and to send our love and solidarity to our friends and comrades from Orange Fence and The Factory. Our attempt to occupy the British embassy failed but we at least managed to block the front door with our banner and spread some English/Czech flyers.